During Dussehra Navaratri in October 2018 we went on a family trip to Tamil Nadu. We took the morning flight from Hyderabad to Chennai. On Day 1 of our trip we visited Kapaleeshwar temple in Mylapore and Parthasarathy temple in Triplicane, Chennai. On Day 2 we went on a temple tourism in Kanchipuram. 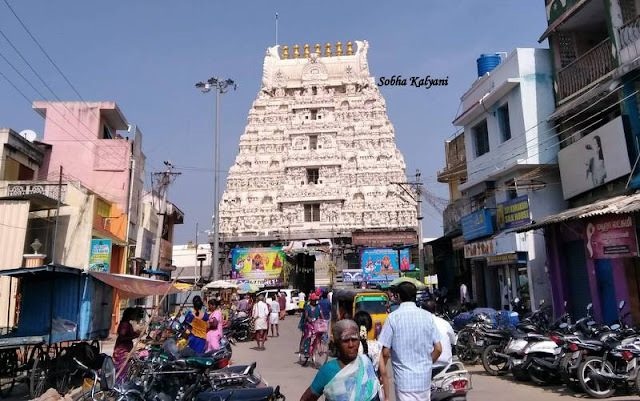 We started early morning from Chennai and reached Varadaraja Perumal temple in Vishnu Kanchi where we spent some time in the morning. From Varadaraja Perumal temple we proceeded to Kanchi Kamakshi temple popularly known as Kamakshi Amman temple. By the time we reached the temple it was around 11 a.m. I felt very much blessed as our visit was on a Friday during Dussehra festival (a highly auspicious day of the year), the day of the week which is very dear to Amman (Ammavaru) and the important festival of Amman. The temple was heavily crowded with devotees and the weather was too hot. The Gopuram / the entrance tower to the temple. Kanchipuram is popularly known as Kanchi and was known as Conjeevaram during the British Rule. It is an ancient city with historical and religious importance. It remained the capital city of the Pallava Kings. Kanchi is an important Vaishnavite pilgrim place, Shaivite pilgrim place and also an important Shakti peetham. It also has Kamakoti peetham established by Sri Adi Shankaracharya. The place is famous for its ancient temples and also famous for silk saris. Kanchi pattu (silk) saris has earned world fame. The only drawback of this ancient city is the weather i.e. unbearable hot weather during the day. Kanchi Kamakshi temple is located in the middle of Shiva Kanchi and Vishnu Kanchi. There are many Shiva temples in Vishnu Kanchi so also there are many Vishnu temple in Shiva Kanchi. Adi Shankaracharya has installed Sri Chakram in Kamakshi Amman temple. According to historical evidences, the temple is about 1600 years old. This is one of the major Shakthi Peethams in India. 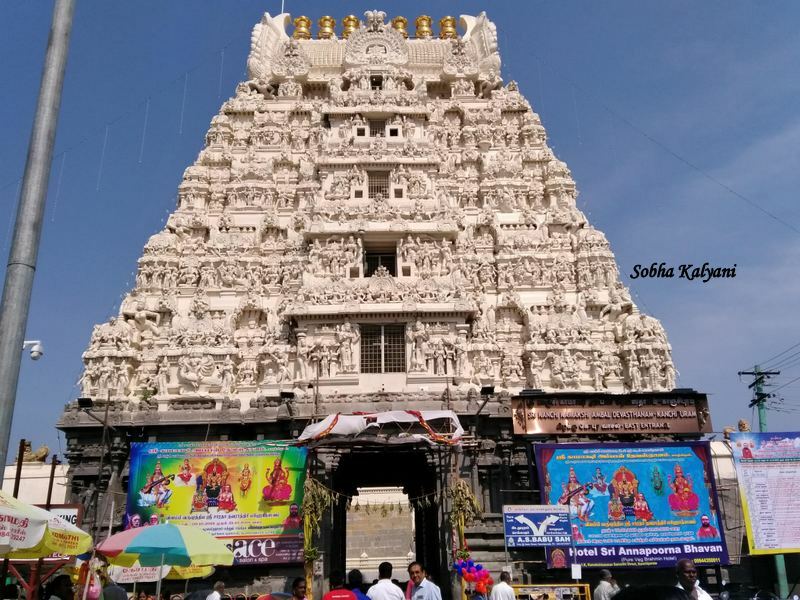 Cameras, videos and cell phones are strictly prohibited inside the temple premises. The temple is dedicated to Kamakshi also known as Sri Lalitha Maha Tripura Sundari. The main idol of Kamakshi Amman is in a sitting posture of majestic Padmasana posture with a powerful mesmerizing radiant face. 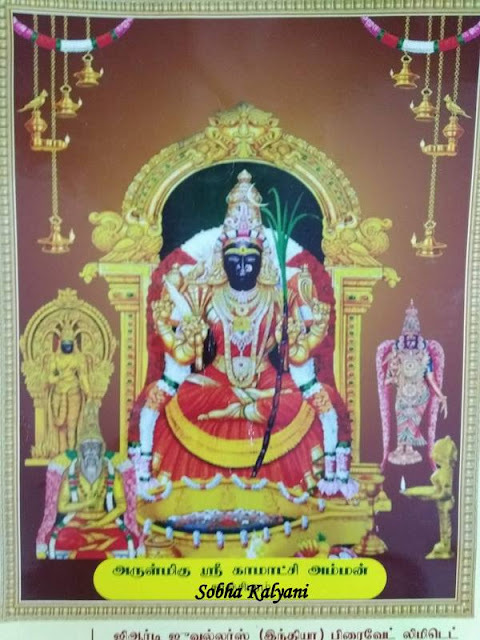 The goddess has divine chakras 'pasa' (lasso) in the left lower arm and ankusha (spike) in right lower arm, pushpabana (a five petaled lotus and parrot) in the right upper arm and a sugarcane bow in the left upper arm. The 2nd sloka of 'Devi Khadgamala stotram', says "Vande Pustaka Pasamakusadharam' which means Salutations to the one who holds 'pasa' and 'ankusa'. The sanctum sanctorum where Kamakshi Ammavaru resides is known as the 'Gayatri Mandapam'. Legends say that Goddess Kamakshi (Parvati Devi) meditated under a mango tree worshiping a Shiva Lingam made of earth (sand). The mango tree is in Ekamreshwar temple in Shiva Kanchi. Well getting back to our visit to Kamakshi Amman temple, there was heavy crowd as it was a Friday during Dussehra Navartri. However, we could manage to go balance ourselves the push / pull from all sides and could have the darshan of Kamakshi Ammavaru from a distance. After darshan as we were walking in the temple premises we saw many devotees waiting outside for performing some puja. On inquiring one of the temple priests we came to know that we can perform Devi Khadgamala Puja sitting right in front of Kamakshi Amman, which will start at around 2.00 p.m. Though the price for this puja was on the higher side, we wanted to perform the puja as it was a highly auspicious day for Ammavaru. We decided to perform the puja and the priest wrote our name in his list. All the required material is provided by the temple and we need not buy any puja material. Initially the priest asked us to sit inside (premises outside the garbha griha) and he made us to do the 'sankalpam' for the puja. Then we had to wait for nearly 2 hours and then the priest called the names as per the list. For performing pujas inside men and women must wear traditional dress. Only couples (two members from a family) are allowed for this puja. When our name was called we too went inside and by that time the place in front of Kamakshi Amman, is occupied by many devotees. So we had no place to sit but we had to stand while the puja was being performed. We stood in front of Kamakshi Amman for nearly an hour watching in Bala puja (worshiping a child as an incarnation of Bala Tripura Sundari Devi) and then Suvasini puja (worshiping married woman) in mesmerism. During my stay in front of Kamakshi Ammavaru watching the pujas, I was completely lost in a divine world forgetting about or so to say leaving the materialistic world behind. I felt very much blessed when I applied kumkuma (vermilion / sindoor) to the child to whom Bala puja was performed. After the puja was completed harati was given to the goddess. And finally the devotees went in lines collecting prasad from the priests. We were blessed to visit Kanchi Kamakshi temple on Friday during Dussehra festival. In spite of the heavy rush, we could have a satisfied darshan of the goddess.